This talc-free, tapioca-based powder is formulated with skin-conditioning agents to absorb excess moisture and leave your skin feeling silky smooth. Purisorb® contains natural herb-based ingredients that are known to benefit the skin, including aloe and vitamin E. This all-purpose formula is excellent as an after-bath freshener and it’s gentle enough for the whole family. Adults: Use daily on skin to feel fresh and dry. Infants: Change nappy, cleanse nappy area, allow to dry. 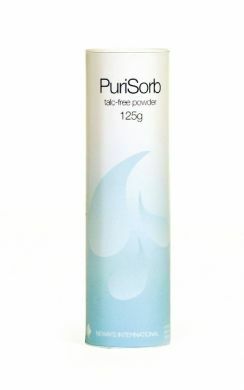 Carefully shake Purisorb powder into the new nappy or apply to nappy area close to skin and away from child’s face. Do not use on broken skin.